A beautifully restored village house in the heart of a Tuscan medieval borgo, Terry�s Nest offers stunning views over a wooded valley. The house was recently restored by local craftsmen using traditional local materials such as pietra serena The house has three double bedrooms; large lounge/dining room, two kitchens, two bathrooms and a covered terrace with outside dining. 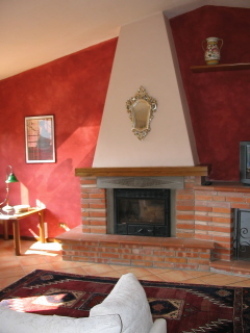 In winter there is gas central heating and a wood fired combustion stove in the lounge. 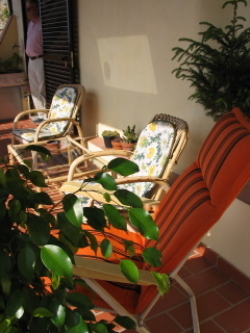 The house is approached on foot (the nearest parking is some 200 metres away) and is suitable only for active guests. The payoff is a wonderful peaceful setting overlooking an outstandingly beautiful and dramatic panorama of rolling hills and valleys. Bed linen and towels and provided weekly. English speaking owners live near by. Own transport is essential. 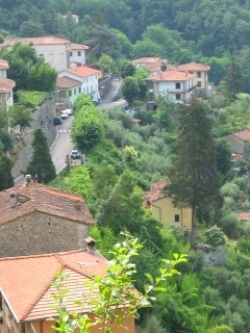 The village of Vellano is set in the foothills of the Appenine Mountains, north of Pescia and within easy distance of Lucca, Florence and Pisa, the world famous spa town of Montecatini Terme and the beaches of the Versilia and of Liguria including the Cinque Terre. 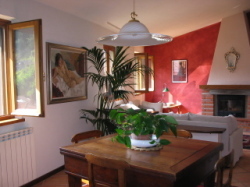 In the wintertime it is about an hour�s drive from the little ski resort of Abetone. There is splendid walking and hiking to be had in the surrounding hills and some traditional sagre (village fairs) are held during the summer months.